Modi should not see AAP victory as having relevance only for Delhi. Kejriwal should not see it as having meaning beyond Delhi. This election is history, and now begins the campaign to understand it — for the AAP, the BJP, their well-wishers and armchair analysts (like myself). The key to the analysis is that it should not be circular, or tautological, that is, it happened because it happened. And most importantly, this analysis should be able to explain, or at least be consistent with, the resounding defeat of the AAP and the victory of Narendra Modi just eight months ago — and the complete reversal today. Indeed, the AAP has done one better than the BJP. It has won 67 out of 70 seats; the BJP won “only” 60 of these same 70 assembly constituencies in the Lok Sabha (LS) elections of 2014. One popular opinion among experts is the refrain that, as is well known from opinion polls and surveys, the Delhi voter had long ago decided that they would vote for Modi at the national level and for Arvind Kejriwal at the state level. The only problem with this internally consistent explanation is that one would have to ask why Delhi is so different from Maharashtra, Haryana (right next door and with a lot of the same “voters”), Jharkhand and Jammu and Kashmir. Delhi might be the capital, and quirkily different, but it is not unique. If it is, it will be a sad blow to the ambitions and hopes of the AAP to go at least partly national. One other popular explanation is that the election proves there is a steep class divide in Delhi, that is, the poor voted for the AAP and the middle class and the rich voted for the BJP. This hypothesis is false on so many counts that it is difficult to know where to begin. For beginners, the AAP has won nearly 100 per cent of the seats across all three income classes — low, medium and high, as defined by Cicero/ Headlines Today. Second, the AAP scored a 100 per cent knock-out only in the high-income category. Third, the poor in Delhi, according to the Tendulkar “absolute poor” definition (around Rs 90,000 per year for a family of five in February 2015 prices), constitute less than 10 per cent of the population. For an income level 50 per cent higher (Rs 1.35 lakh per year), the poor are 25 per cent of the population. So, let us forget the notion that class war was an explanation, let alone an important explanation. And while we are at it, let us also forget that caste considerations mattered. Even if class and caste are strongly correlated, as some claim, if income did not matter, how come caste did? Finally, let us reject the hypothesis that what explains this historic election is the non-support of the rank and file of the BJP, or the famed political prowess of the RSS workers (this rank and file has not won a Delhi election in more than 20 years), or their non-acceptance of Kiran Bedi as an interloper, or the sheer political ineptitude of Bedi. To be sure, all of these things mattered, and they chipped away at BJP seats, but really, the story would be no different if the AAP had obtained “only” 55 seats. Because what has happened in the Delhi election 2015, purely and simply, is history. 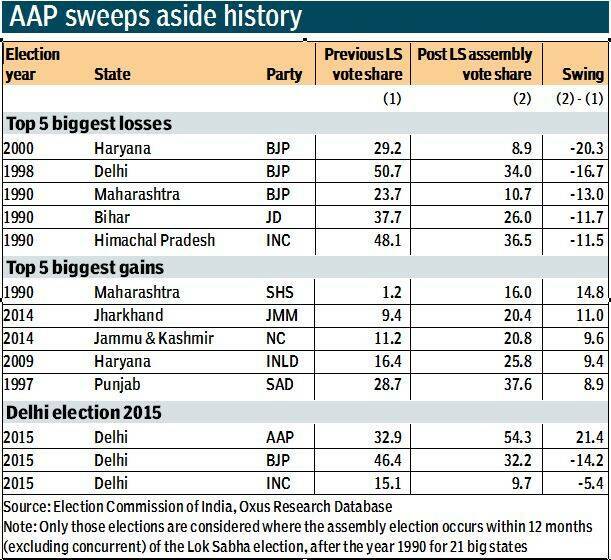 The table lists the 10 biggest wins and losses in assembly elections countrywide in 21 big states, since the coalition era began post the 1989 V.P. Singh election. Obviously, there have been more elections, but the criteria limit our selection to only those assembly elections held within one year of the preceding Lok Sabha election (a total of 29 elections). The highest win/ loss is the 2015 AAP victory in Delhi (a swing of plus 21.4 per cent); the second highest was the loss by the BJP in Haryana in 2000 — a swing of minus 20.3 per cent. Okay, we agree on what does not explain history — but what does? The story about explaining this election has just begun, both by me and other self-styled experts. My partial, but not small, interpretation of what happened proceeds as follows. First, the conclusion. Just eight months ago, Modi had pulled off one of the most stunning victories ever. His platform, and appeal, was the delivery of both economic growth and governance. He has delivered on economic growth on several fronts — and I am not basing this conclusion on the new GDP data. A lot of initiatives and initial steps towards a reformed economy have already been taken, and Budget 2015 is likely to take this process considerably ahead. But where Modi has failed is in providing political governance. Ever since May 2014, India has been subjected to a barrage of actions oriented towards the encouragement of social disharmony. The list is long, but here are some examples. “Love jihad”, or attempts to interfere with the private lives of young Indians; the non-discouragement of honour killings in the name of caste; ghar wapsi, or attempts to go against the basic tenets of Hinduism in aggressively pursuing proselytisation; the initiative to make the learning of a dead language like Sanskrit compulsory, as one of three “compulsory” languages; the continuous attempts to make the lives of minorities even more insecure (burning of churches in Delhi, especially a city going to polls); the non-condemnation and non-removal of a minister stating that those who were not Hindus were “haramzade”; the tolerance of statements that Hindu women should have four kids in order to boost even more the 80 per cent-plus Hindu population; the continuous pursuit from high-level officials about India being a Hindu nation and the attempt to revive the building of a Ram temple in Ayodhya; the tolerance of a BJP-appointed censor board official, Ashoke Pandit, who attempted to censor humour and free speech by being even more vulgar, and in a non-joke way, than anything that the AIB could ever say, let alone said (Congratulations guys, but I am disappointed by the fact that you are apologising for hurting “sentiments”); and the wearing of an expensive Rs 10 lakh or whatever embroidered suit for the meeting with US President Barack Obama. For the quarter of Delhi’s households, which live on less than Rs 1.4 lakh a year, that is seven years of food, shelter and well-being. These tendencies towards social disharmony have been condemned by many, including supporters of Modi, Jagdish Bhagwati, and well-wishers like Obama. This all adds to the anger of the middle class and the rich — in addition to the anger of the poor. What happens next? I think the Delhi election will turn out to be a win-win election for India, Delhi, Modi and Kejriwal. The Delhi wake-up call is likely to considerably improve governance under Modi — and improve the chances for economic reforms and growth initiatives. Modi is one of the most astute politicians the world has seen, and he is likely to see what he needs to do in order to achieve his goal, everyone’s goal, of a free and prosperous India. Equally, Kejriwal knows that he now has to deliver on governance by actually governing. With the great mandates that both Modi and Kejriwal won, come great expectations — and not meeting those expectations even halfway bring about greater disappointments. The Delhi lesson for Modi is that he should not see the AAP’s victory as having relevance for only Delhi. And the lesson for Kejriwal (as well as the AAP) is that he should not see the Delhi election as having meaning beyond Delhi. 3 Who rules the city?